It’s the week of Thanksgiving, and the markets can’t seem to find anything for which to give thanks. Typically, this week is marked by low volatility and non-existent volume as anyone on Wall Street worth a darn takes time off. Junior traders are left to manage the books and not screw up too badly. Things might not work out that way this time. For the first time in its 25-year history, the Asia Pacific Economic Cooperation summit ended on Sunday, November 18, 2018, without a joint statement. The reason was obvious. Locked in a trade battle, Vice President Mike Pence stared down Chinese officials while calling them out on unfair practices. The Chinese weren’t impressed. With the two sides farther apart than when the conference started, they couldn’t even muster the standard pablum about ‘everyone wants better trade, cooperation, blah, blah, blah.’ They just boarded their respective jets and left Papua New Guinea as fast as they could. The cold news from the tropical setting left investors with a chill as the markets opened on Monday, and the price of oil isn’t helping. For the past two months, the energy industry has struggled. As economic reports point to slower growth around the globe and President Trump hands out waivers to buy Iranian oil like candy at Halloween, the price of oil dropped from a multi-year high to bear territory. But don’t worry! Saudi Arabia wants to curb production again, if they can get the Russians to agree. So far, markets aren’t buying it. And then there’s the weather. Several Arctic blasts are driving across the United States, bringing chilly temperatures to the South, Mid-Atlantic region and the Northeast. The cold makes it feel more like the holidays, which is nice, but too much of it could keep shoppers from the stores on the all-important Black Friday weekend. Bringing more negative news to the fore, we get reports on housing starts tomorrow, and existing home sales on Wednesday. The housing market index came in well below expectations this morning, so no one expects good news on this front over the next couple of days. For the past ten years, we’ve delivered the same message. Stay true to your investment approach, by installing active management systems to all liquid accounts and owning other assets than cash, bonds, and stocks to your portfolio. With so many variables in play, now is not the time to even attempt catching falling knives. As your investment strategy systems sell stocks that reach their limits, be content to sit on the sidelines with a rising pile of cash. 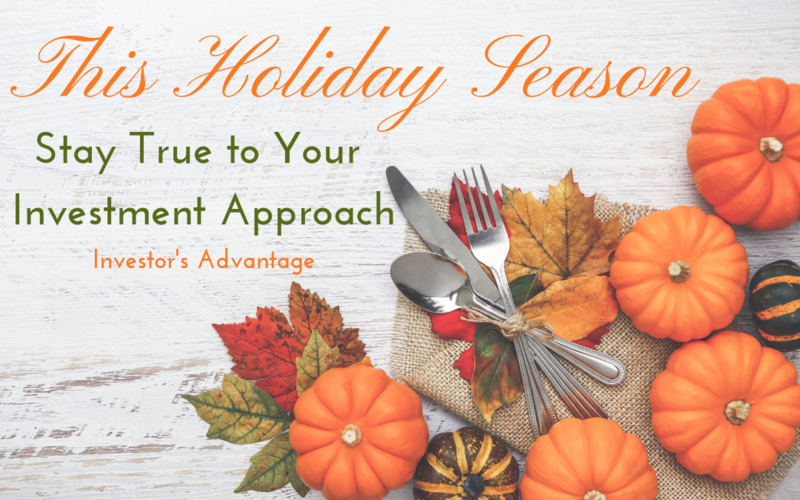 In keeping with the holiday theme, you’ll be thankful you put your active management strategies in place. You can’t see the future, but you can prepare for the good, the bad, and the unforeseen.